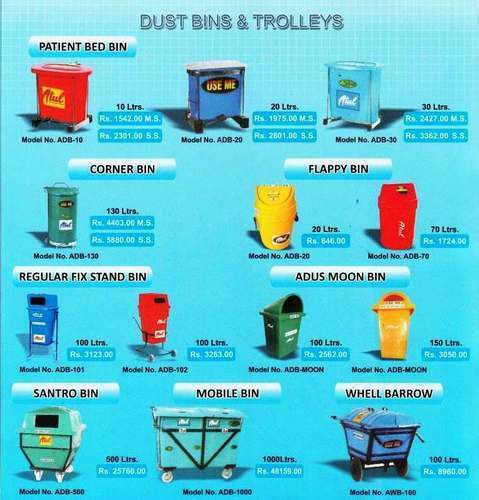 Manufactured with finest raw materials and modern machinery in compliance with the set industry guidelines, quality of this range of Dustbins never deteriorates. Available in a varied range of sizes, these dustbins are widely demanded in hospitals, offices, shopping complex and multistory buildings. Easy to clean and sturdy in construction, the proffered dustbins are handed over in standardized packaging, so as to prevent damages. Atul Pumps Pvt.Ltd. (Atul Group of Industries) was founded in the year 1988 as the eminent name responsible for manufacturing and exporting Water Tanks & Dustbins. Our experts carry out the designing & development procedure in conformity with the approved industry norms and thus, products introduced from our end are integrated with flawless configuration. Under our product gamut, we have brought forward Water Tanks, Wheel Barrow, Garbage Dustbins, capable of delivering excellent performance along with reduced maintenance cost. The complete manufacturing procedure is accomplished at our workplace using the latest range of machinery and tools. In the process, we are supported by trained & skilled personnel responsible for regulating the entire venture. Thus, we are here availed with the quality-centric approach in order to meet the expectations of customers. Today, owing credit to these working attributes, we have business terms with some of the reckoned names in the industry such as Director General of Supplies and Disposals, Bharat Sanchar Nigam, Prasar Bharti, Telecast & Broadcasting Department, Para Military Forces and World Bank Aided Projects. We export our products in Nepal, Bangladesh, Egypt, Sri Lanka, Afghanistan & Africa.